Neck & Shoulder Pain, Ever-Eden 9″ All Natural Latex Mattress. Home → Bulging Discs → Neck & Shoulder Pain, Ever-Eden 9″ All Natural Latex Mattress. I’ve had pain and stiffness in my neck and shoulder and numbness from my elbow to pinky finger for some time. I went to the Dr. and I have a bulging disk. I know it it from sleeping on my side in my bed, because when I sleep on the sofa, I stay on my back and the pain and numbness is reduced. I am 6’1″ 260lbs. and 38 y.o. with no injuries not caused by my bed and pillows. After research and trying so many models including 3 brands of latex mattresses (Pure Latex Bliss, Savvy Rest and Prana). I am sold on all Talalay latex. All 3 brands had their pluses and minuses. The minus being there was still some pain and numbness. I noticed on the blog, several mentions of Reverie beds that allow the user to customize firmness from head to toe. I like the idea, but they have no showrooms. “European slat” foundations claim to do the same and are sold by many latex mattress mfgs. online. What is your opinion of these customizable systems? I tried a couple adjustable beds. I really liked those. They kept me from rolling over while still supporting the lumbar area when a latex mattress was on top. I sleep hot and want to protect my investment. Customer reviews show that any protector with a vinyl or polyurethane backing sleeps hot regardless of what the mfg. says or what sheets go over it. I haven’t seen any reviews of the Danican Nature Protect, but their website says their backing is made from the same material as Band-aids. Honestly, how hot does the Danican protector get? Sorry for such a long email. First off, the Danican mattress and pillow protectors sleep cool…not hot at all. Second, you’re sold on that which won’t work for you…an all Talalay Latex mattress. Talalay is a more supple product than Dunlop latex and is ideal for surface comfort. Whereas the more dense Dunlop latex is better for support….especially when you’re looking to support a large person. For that reason, we recommend the Ever-Eden all-natural latex mattresses. 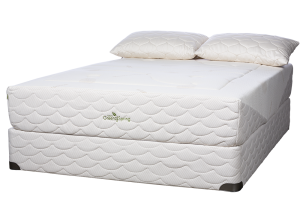 The 9′ is the most comfortable, using a 6″ Dunlop core and topped with 3″ of soft Talalay latex. Here is the link to those products. I’m not a big believer in the value of an adjustable bed base for sleeping. In any position but flat, you’re sleeping with your spine mis-aligned. It’s a good thing to have if your bedroom is also your hang-out room. Reverie mattress are sold only with their adjustable bed bases. We were excited, when we got the line, but dropped them when we found out that they won’t allow their mattresses to be sold separately. Moisture from perspiration causes premature wear. Protect your investment with high quality, Waterproof Mattress and Pillow Protectors that sleep cool and don’t shrink. A Long Lasting Mattress for a Big Man. A Latex Mattress Topper for My Son in College.